Active form of vitamin B12 is adenosyl cobalamin or kobamamin. Cyanocobalamin has a marked hypolipidemic effect; he warns fatty liver, increases oxygen consumption by cells in acute and chronic hypoxia. Vitamin B12 is involved in transmethylation, hydrogen transport, activates the synthesis of methionine. Leveraging the synthesis and the ability to accumulate protein in the organism, cyanocobalamin is also an anabolic effect. Increasing the phagocytic activity of leukocytes and activating activity of the reticuloendothelial system, enhances immunity. Low levels of cyanocobalamin twice accelerate disease progression in people with AIDS. Furthermore, vitamin B12 plays an important role in regulating the function of hemopoietic organs: it participates in the synthesis of purine and pyrimidine bases, nucleic acids necessary in the process of erythropoiesis, an active influence upon the accumulation in erythrocytes of compounds containing sulfhydryl groups. It depends on the availability of cyanocobalamin wide range of emotional and cognitive abilities. Maintaining an optimal level of this vitamin helps prevent depression, dementia and confusion of thought, helping to curb the decay of mental activity as a result of AIDS. Vitamin B12 helps to overcome insomnia, and helps to adapt to changes in sleep and wakefulness, which is explained by the participation of cyanocobalamin in the synthesis of melatonin. Cyanocobalamin helps normalize low blood pressure. Vitamin B12 is one of the substances necessary in the health of the reproductive organs of men and women, so he can correct the reduction of sperm in the seminal fluid. Poor assimilation of food, constipation, increased liver. Chronic fatigue, irritability, depression, dizziness, ringing in the ears, drowsiness, headaches, shortness of breath, visual disturbances, hallucinations, memory loss. Pernicious anemia, neurological disorders, immunodeficiencies, gastroduodenitis, gastric ulcer and duodenal ulcer. Even a small reduction of cyanocobalamin in the blood compared to the norm can cause considerable damage in the brain and nervous system. Application of cyanocobalamin shown pernicious anemia patients, agastricheskoy hyperchromic anemia, with anemia in pregnant women, as well as liver diseases and chronic pancreatitis. 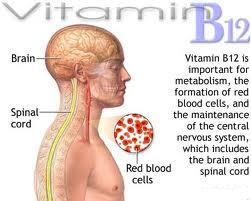 Expedient of vitamin B12 in radiation sickness, diseases of the nervous system (multiple sclerosis, encephalomyelitis, sciatica, polio, cerebral palsy, etc. ), allergic diseases (asthma, urticaria). The use of vitamin B12 is shown in premature and newborn infants after infection. Prescribed for the treatment of cyanocobalamin intramuscularly, subcutaneously or intravenously to 0,1-0,2 mg 1 every two days. When ingestion of cyanocobalamin is poorly absorbed, absorption can be somewhat improved by simultaneous administration of folic acid. Acceptance of cyanocobalamin is contraindicated in acute thromboembolism eritremia,erythrocytosis. Caution should be used tsianookbalamin patients with angina pectoris. Absorption of cyanocobalamin can prevent potassium. Since cyanocobalamin accumulates throughout the body, while taking potassium short course's hazard, but long-term use of potassium (e.g., in patients taking diuretic drugs) can lead to depletion of cyanocobalamin. When receiving antihyperlipidemic of disturbed absorption of vitamin B12. Corticosteroid hormones, as well as neuroleptics contribute to leach of cyanocobalamin. Cyanocobalamin deficiency can occur when taking anti-TB drugs. Vitamin C in large amounts can affect the ability to absorb vitamin B12 from food.